Lovely … looks like a very popular place! Our book group took a trip out on the punts a couple of weeks ago. A lovely leisurely ride but not easy getting in and out when you get a bit older! And this is stunning as usual Judith! Fave, I have missed your Cambridge shots! 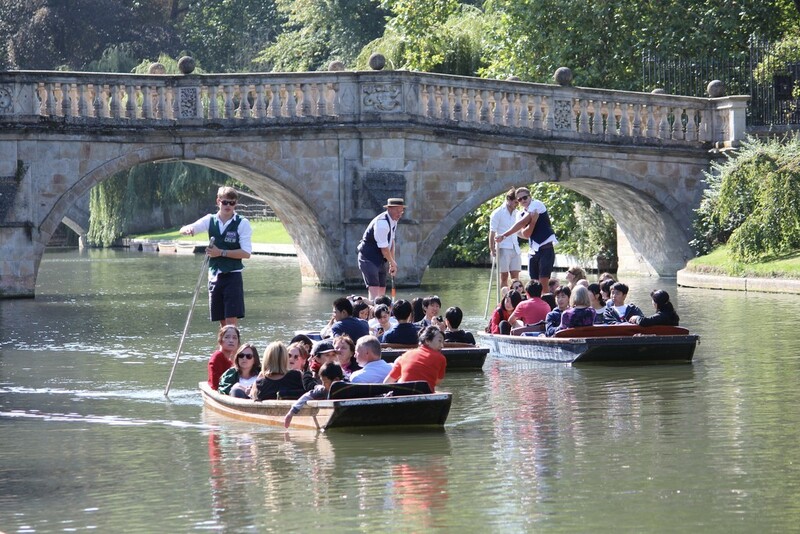 Quite a few of our Eastern friends in these punts, loving it & taking it all in. Beautiful light & reflection. That gorgeous bridge not to be missed either! @lynnz Ah it gets a lot worse than this! @busylady Yes it’s much nicer now the river conservation people have got control over the numbers again. Need a nice strong punt guide to get you in and out! Lovely scene, great light and.reflections! Aaah, it is bliss when the tourist season calms down, isn't it? Lovely shot. I wonder how many wild tales are being told about the missing chunk of ball on Clare Bridge at this moment in the shot! I don't think I would like to be stuffed in one of these boats with other tourists! But maybe tourists don't mind cuddling up! Good for trade! And a beautiful picture!